Planning for epilepsy surgery depends substantially on the delineation of epileptic foci, and on the creation of a functional map of eloquent cortex (e.g., language/motor cortex). Traditionally, different methodologies have been used to produce this functional map, most notably electrical cortical stimulation (ECS) mapping, but all these methods have substantial problems that increase the risk to the patient and the time and/or cost associated with surgical planning. Patients undergoing epilepsy surgery would benefit greatly from a mapping methodology that is safe, can be rapidly applied, is comparatively inexpensive, procedurally simple, and also congruent to existing techniques. Over the past several years, we have been developing a novel procedure (i.e., software and detection algorithms) for passive functional mapping of eloquent cortex12. 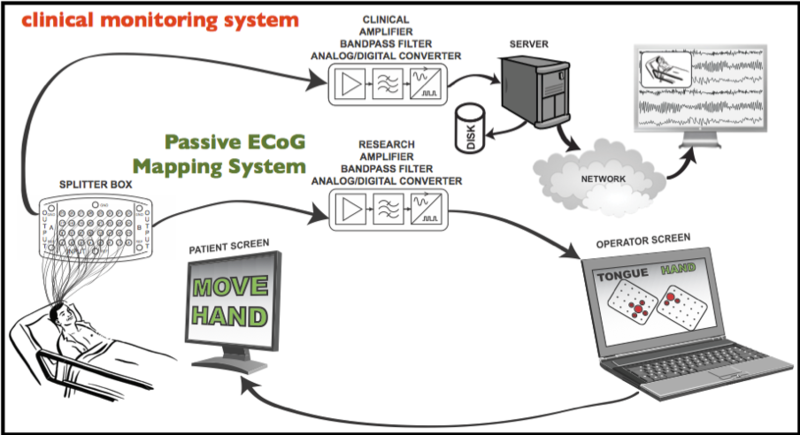 Together with appropriate signal acquisition hardware, this procedure interprets, without configuration by an expert and at the patient’s bedside, gamma changes in electrocorticographic (ECoG) signals that are passively recorded from subdural grids (which are already implanted in the patient as part of typical monitoring protocols). 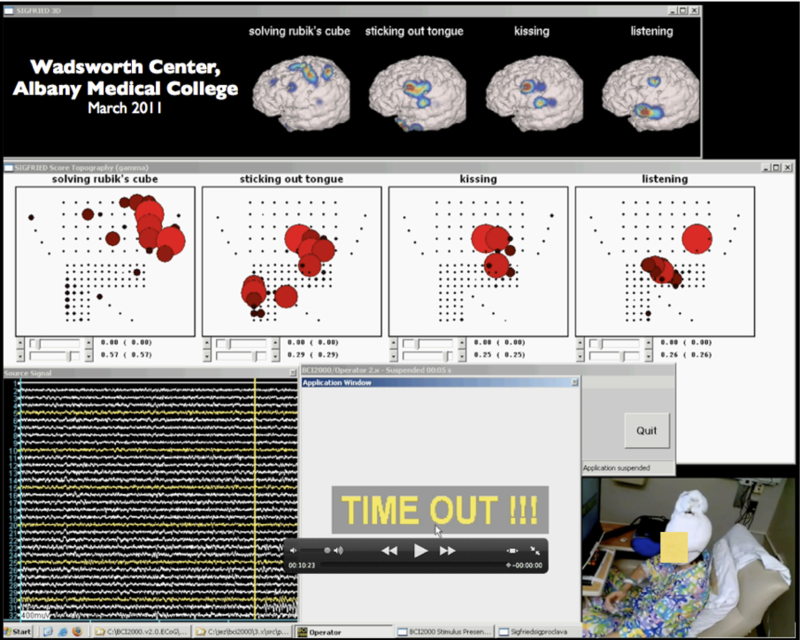 Within minutes, this novel method identifies, on a 2D or 3D topographical display that is updated in real time as the patient performs different tasks, those cortical locations whose activity changes in response to the task. The figure on the right gives results of our mapping in one patient after about 3 minutes. In this figure, the 3D topographies on the top highlight different locations on the left hemisphere that correspond to hand motor function (left), facial movements (2 center panels), and receptive language function (right). The topographies below show the same information in two dimensions (each dot represents one electrode and its radius corresponds to the amount of change). We recently documented the substantial congruence of our method to conventional ECS mapping in a multi-center study in ten patients3, and also worked with collaborators to explore its efficacy in awake craniotomy cases4. Because our procedure rapidly, accurately, and safely maps eloquent cortex, its widespread integration in epilepsy surgery protocols will directly lead to a reduction in patient morbidity and will increase the population of patients that can be effectively mapped (e.g., pediatric patients, in whom ECS mapping is problematic).